Holy Trinity Lutheran Church (Evangelical Lutheran Church in America), a Bible-based, growing and active congregation, is located at the crossroads of Muncie, within walking distance of Ball State University and minutes from downtown. Holy Trinity, organized in 1889 and originally located on the corner of Howard and Liberty Streets, was the first Lutheran church to be established in Muncie, Indiana. The congregation grew considerably in the 1950s, requiring a new church building. 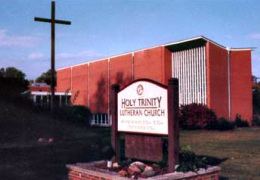 Holy Trinity opened the doors of its current location on White River Boulevard in 1961, and the congregation continued to grow thereafter. In 1950, Holy Trinity sponsored a chapter of the Lutheran Student Association at Ball State University—now called Grace Village, a Lutheran and Episcopal campus ministry. In the 1960s, Holy Trinity’s educational ministries were strengthened, and in the 1970s, under the leadership of Pastor Stan Peterson, the church expanded its local and international outreach ministries. Both are important characteristics of the Holy Trinity’s mission today. We believe our living God is present yesterday, today and forever through Jesus Christ, who forgives all sins and transforms lives through his death and resurrection. As followers of Christ, the Holy Spirit calls each of us to share the Gospel with those in our community. Holy Trinity lives out this calling as we participate in ministry projects with area churches, including Project Stepping Stone, Thanksgiving and Christmas Food Baskets, Open Hands food distribution ministry, CROP walk, Christian Ministries of Delaware County, and Salvation Army bell-ringing. We offer a variety of activities and education classes, including Children’s Church, Sunday School, Adult Forum, Youth Group and Confirmation. Christian fellowship and support is found through our small groups, ministry teams, choir, and book club. Whether you're just starting your spiritual journey or you're looking for ways to grow deeper in your faith, Holy Trinity Lutheran Church is a great place to be!